UK, 2005, 133 minutes, Colour. Daniel Craig, Yekaterina Rednikova, Gabriel Macht. 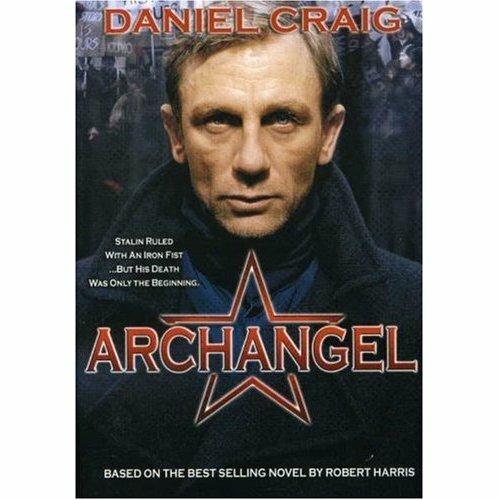 Archangel is a version of Robert Harris’s celebrated novel, speculating on the fact that Stalin may have had a son who was exiled to Siberia but, at the beginning of the 21st century, was to be a figurehead for a new communist revolution. Harris has written a number of novels including Pompeii as well as Fatherland, a speculation about the world had Hitler won World War Two. There have been film versions of his novel Enigma with Kate Winslett and of Fatherland with Rutger Hauer. The film is interesting in its presentation of the speculation, of the location photography in Estonia and Russia, of the opportunity to reflect on the Stalinist era, the cruelty of Stalin, the change with the fall of the Soviet Empire and the lingering communists who yearned for Stalin’s days. Daniel Craig is the history professor at the centre of the revelation of the news about Stalin. Craig had a solid screen CV with such films as Love is the Devil and Elizabeth as well as Some Voices and also The Layer Cake. He was catapulted into The First Run with his performance as James Bond Casino Royale. The film was made for television and directed by Jon Jones who directed the telemovie about Mrs Beaton as well as a television version of Jane Austen Northanger Abbey. 1.An entertaining thriller? Conspiracy and speculation? The popularity of this kind of novel? Film? The adaptation of Robert Harris’s novel? 2.The Russian settings, the Russian locations, Estonian locations? The city of Moscow and its detail? The streets, the underground, hotels, clubs? The Russian countryside and its isolation? The city of Archangel? The atmospheric musical score? 3.The title, the city, its place in Soviet history, the nuclear submarine fleet, accidents in Archangel? The location for hiding away the son of Stalin? 4.The structure of the film? The focus on Fluk Kelso, as a lecturer and writer, the group in Moscow, the information from the old man, his pursuing it, the American television correspondent and his interest, the tracking down of Zinaida? The death of Zinaida’s father? The confrontation with Mamentov? The other Russian authorities? The flashbacks to Stalin, the young soldier, the witnessing of Stalin’s death, Beria and the burial of the manuscript? 5.The focus on Kelso, as a character, his expertise on the Stalinist era? The lecture, the entourage? His getting the information, following it through, discovering the old man’s body? Tracking down his daughter? The club? The interactions with O’ Brien? The meeting with Mamentov? The other authorities? His staying behind? Going to the library, charming the librarian, getting the information about Stalin, about Beria? His being led to the manuscript? The dangers, the pursuit, the police, the deaths? With Zinaida? The decision to go to Archangel? With O’ Brien, their eluding O’ Brien? Travelling east? The city, getting the information, the authorities? Finding the young woman’s mother? The background of the diary, the young girl, the flashbacks and seeing her going from Archangel to Moscow, the relationship with Stalin? Her return, the birth of the child, her death? 6.Fluk and his going to see the mother, getting the information, finding out where the son was? The story of his being taken away? Tracking down the son, with O’ Brien, O’ Brien and his camera? The crash in the river? Seeing the son of Stalin, taking them to the house, his personality, resemblance to Stalin, intensity, madness, admiring his father, studying his documents? 7.The attack of the pursuers, the military, the official, his pulling the gun on the soldiers? Kelso and O’ Brien escaping? The pursuit, O’ Brien’s death? Kelso and his escape on the river, the return to Archangel, finding that Zinaida had been arrested, in prison, the bribe to get her out? Zinaida, her studying law, her being a callgirl at the club, the first encounters with Kelso, her resentment towards her father, her father and his not following the party line, wanting the manuscript for his daughter, his death? Her decision to go with Kelso? The dangers, the shootings, going to Archangel, with the mother, her arrest, prison, release? 8.The final confrontation between Kelso and Mamentov? The realisation that Mamentov has orchestrated everything: Kelso’s lectures, the group, the old man being part of the story, getting his curiosity, finding the manuscript, Mamentov buying Beria’s house? The motivation: the authenticity of the documents if they were proclaimed by Kelso as a reputable historian and author rather than Mamentov? 9.O’ Brien, his brashness, the film, wanting to get the story out, his contacts? The scenes on the television? Precipitating Mamentov’s move? The train trip, the crowds acclaiming Stalin’s son, his appearing at the steps? Zinaida and her decision, the flashbacks to her childhood with her father and the gun, her shooting Stalin’s son? 10.The film ending at that moment – allowing the audience to speculate on what might happen? 11.The background of Russia, the Stalinist era, the prisoners in the gulags? The changes with Gorbachev? The Putin era? The resentment of the old-style communists? Their moves for power? The background of the contemporary Russian authorities, bugging rooms, pursuits? Military? 12.A satisfying entertainment – thriller, history, conspiracy theory?